On Memorial Day 2011 Gabriela, age 9, found a bird’s nest on the ground. In the nest was a dead mother and dead baby bird, but miraculously the second baby bird had survived. The birds were white winged doves (a larger species of the mourning dove). Gabriela convinced her parents that they could save the second baby and rehabilitate it for a return to the wild. The family did their research and began preparations for the rescue. They prepared a box with paper towels and warm light and placed the box atop a heating pad. Their local pet store recommended a special food for orphaned baby birds. 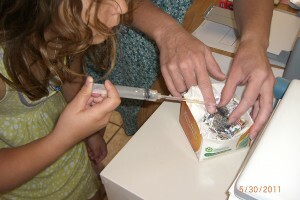 The family, well actually mainly Gabriela, began the tedious process of feeding the orphaned dove with a small straw. 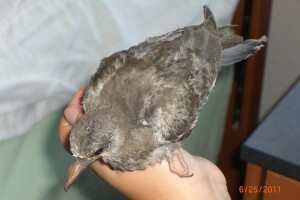 Against all odds, the orphaned white winged dove, now named Peeper, managed to survive, grow feathers and learn to fly. The major problem was that Peeper did not feed himself. Gabriela found out about East Valley Wildlife and talked with Darlene, an experienced wildlife rehabilitator with EVW. Darlene contacted Jeanni, another volunteer with EVW. Jeanni is a quail specialist, who just happened to have some white winged doves that she was rehabbing. Gabriela agreed to entrust her beloved Peeper to Jeanni. 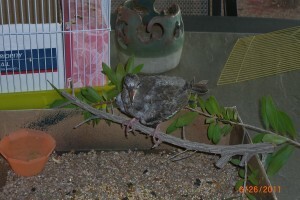 The dove was placed with other white wing doves in the hopes that Peeper would soon learn how to eat on his own. It was also important for Peeper to be with other birds and learn more about being a dove so that he could be released together with his new dove family. Peepers thrived and although Gabriela had found it difficult to give up her “orphan”, the dove rescue was a great learning experience for the whole family. ….Could Gabriela be a “budding” volunteer for East Valley Wildlife? Only time will tell. Our thanks to Gabriela, her family and others who take action when they find an animal that needs their help! -Submitted by Darlene and Gabriela’s family. No, I haven’t gone crazy. This story came to me from Ginger around Christmas of last year. Being a hoarder of good news, I kept the blog on file. As Ginger wrote…timing is everything. Blogger’s Note: Not all such stories have such happy endings. Our volunteers, those who handle domesticated species, are finding that there is an increase of abandoned birds, some left in foreclosed and empty homes, some released “back to the wild”. The domestic birds that are released have very little chance of surviving on their own. “Released” birds cannot feed themselves and most often fall victim to predators, both human and animal. As promised, I went back to some archived articles to repost a few of them. This gem came from our volunteer, Ginger, about a chicken rescue. I got a call last week from a young man in Mesa. He had a chicken that hopped the block wall into his yard and fell into his pool. It was bitter cold that night. The poor chicken was soaked to the bone. It was evident that she was under attack, most likely by a dog, and that is what caused her to leap the fence. She had most of her tail feathers missing. Poor girl! 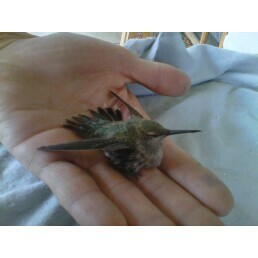 I wrapped her in a warm towel, brought her home and put her in an aviary holding pen with a heat lamp. I checked on her several times during the night, and she seemed okay, but she was whimpering and shivering. I wasn’t sure that she’d pull through. Next morning there she was standing in the pen all bright and cheery ready to face the day. 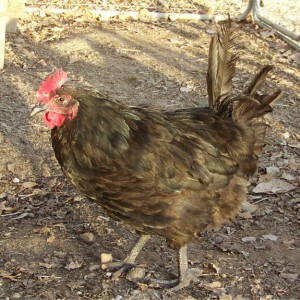 It turns out that she is a Black Australorp chicken. Very pretty girl, well except for the torn tail feathers. She’s very friendly and can be pet and picked up easily. She is up for adoption, but I’m pretty sure that Jeannie will be taking her into her flock. This morning I overslept until 8 AM. When I walked out the front door to get the newspaper, I noticed a neighbor’s cat by my gate. I shooed him off and then noticed a little baby dove in a plastic container that someone had put by the gate where the shade was. If I had walked out there 30 seconds later, that bird would have been cat breakfast! Later a guy called, said he lived nearby and had found the bird and brought it over. (If he knocked on the door, I didn’t hear it.) But he did get instructions to never do that again. People need to realize that they can’t show up at a rehabber’s house unannounced with a rescued animal. And, leaving a rescued animal on the rehabber’s doorstep, especially in this hot weather can be a death sentence for the animal. Remember, contrary to popular opinion….Rehabbers are human…they do oversleep; they get sick; they even go on vacation (rarely); or like many of us they use their garage door and never look on the front stoop. 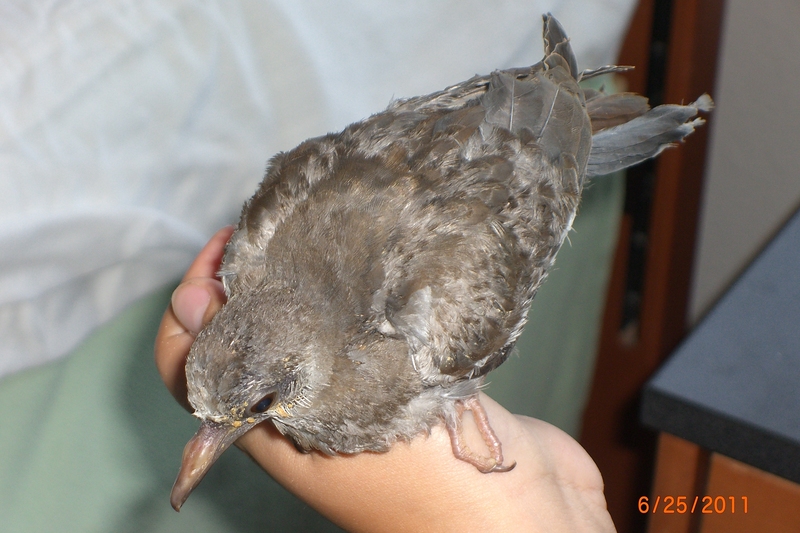 Also, most volunteers specialize in certain animals…SO taking a Cactus Wren to a rehabber who handles only doves or ducks is like taking a parrot to a vet that only takes in cats and dogs. The right diet and housing is needed for the various species. Luckily this story has a happy ending…the little dove was literally saved in the nick of time and is happily cuddled up with 5 new nestmates. Blogger’s note: East Valley Wialdlife wants to thank all those kind-hearted people who take the time to rescue an animal…but Please, when you find an animal and bring it to a volunteer, call ahead, find out if that volunteer takes that species and don’t just leave the bird on the stoop!